Qvar is a preventer inhaler which is used daily to prevent asthmatic symptoms such as wheezing and coughing. How to use Qvar inhalers? The active ingredient of Qvar is beclometasone dipropionate. 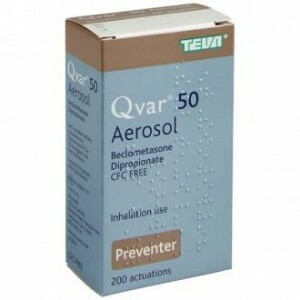 Qvar is available as both an aerosol inhaler and an autohaler. 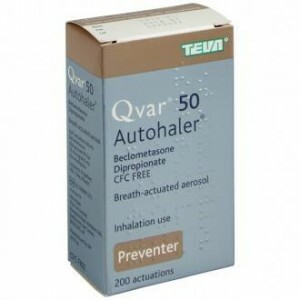 The active ingredient of Qvar inhalers is a corticosteroid called beclometasone dipropionate. These triggers can cause an immune response when a trigger is present in the body. Cells in the body release chemicals to fight the antigen, which results in the airways becoming swollen. Beclometasone inhibits the immune response of these cells, preventing them from releasing these chemicals which cause the inflammation. Due to the way this medicine works, it is ineffective at relieving asthmatic symptoms during the onset of an asthma attack. Preventer inhalers are often prescribed alongside a reliever inhaler to control the symptoms of asthma. Moreover, the effects of Qvar may not become noticeable until after a few weeks of constant treatment. 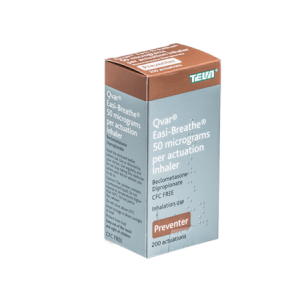 When used regularly, Qvar effectively prevents symptoms of asthma such as wheezing and coughing. Qvar is typically taken twice daily - once in the morning and once at night. This provides effective coverage during the day and during sleep, to prevent acute asthma symptoms. Always follow the doctor's dosage instruction when using Qvar inhalers. When using your inhaler, it is important to sit or stand in an upright position. This helps the medicine reach the lungs more effectively. Before taking your dose, breathe out gently until you feel ready to breathe in again. Your GP or asthma nurse may wish to review your technique, as using the inhaler incorrectly can impact the effectiveness of the medicine. To use an Autohaler, shake the inhaler well before each dose. Remove the plastic cap from the mouthpiece. Ensure the inhaler is in an upright position. Push the tab at the top of the inhaler to an upright position. Place the inhaler between your teeth and ensure your lips have a tight seal around the mouthpiece. Breathe in deeply but steadily. Continue breathing in when you hear the click. Hold your breath for 10 seconds before gently breathing out. To take another dose, shake your inhaler well, push the tab up and breathe in through the mouthpiece as before. When you have finished using your inhaler, put the cap back onto the mouthpiece. To use your Easi-breathe inhaler, shake the inhaler well before each dose. Flip the cap off of the mouthpiece down. Flip the cover of the mouthpiece back up after each puff. To take another dose, ensure the mouthpiece cover has been flipped up. Shake the inhaler, flip the cover down, put the mouthpiece between your teeth - ensuring an airtight seal with your lips - and breathe in deeply and steadily. Always remember to ensure the cap is flipped up when you have finished using your Easi-breathe inhaler. To use your metered dose inhaler, shake the inhaler well before each dose. Remove the cap of the mouthpiece. Place the mouthpiece between your teeth and ensure your lips provide an airtight seal around the mouthpiece. Press the canister of the inhaler down while simultaneously breathing in deeply and steadily. It is important that your timing is precise when using these kinds of inhalers as breathing in too early or too late will decrease the effectiveness of the medicine. Hold your breath for 10 seconds after each puff. To take another dose, shake your inhaler, place the mouthpiece between your teeth - ensuring your lips provide an airtight seal around the mouthpiece - and simultaneously press the canister and breathe in deeply. Once you have taken your dose, place the cap back over the mouthpiece. All medicines carry the risk of side effects, though not everybody experiences them. It's important to understand and be able to identify the side effects attributed to your medication. If you feel wheezy or tight chested immediately after taking a puff of Qvar, do not take any more puffs. Use your reliever inhaler to help your breathing and contact your doctor immediately. In the rare but serious event of an allergic reaction to Qvar, stop using the medicine and contact your doctor immediately. You may need to go to the casualty department of your nearest hospital for urgent treatment. How do I stay safe while taking Qvar? Always read the patient information leaflet enclosed with your medicine before taking it. Always take your medicine as prescribed by a doctor. Do not change the dose without the doctor's consent. Do not abruptly stop using your inhaler, even if you feel well. If you have not used your inhaler for 2 weeks or more, you should test your inhaler by removing the mouthpiece cover and spraying two puffs into the air, away from you. You can buy Qvar inhalers online, after answering a few medical questions for our doctors to review. If the doctor approves your order before 3 pm, our UK pharmacy will dispense your order and dispatch it via a tracked next day delivery service, courtesy of Royal Mail. All our medicines are delivered in nondescript packaging, providing no indication of the contents therein. What should I do if I forget to take Qvar? If you accidentally miss your dose, take your next dose as soon as you remember. If it is near the time for your next dose, skip the missed dose and continue using your inhaler as normal. What should I do if I take too much Qvar? Do not take more than the recommended dose. Using your inhaler more than recommended can exacerbate side effects. Can I take Qvar while pregnant or breastfeeding? If you are pregnant, suspect you may be pregnant, planning on becoming pregnant or breastfeeding, speak to your doctor before taking Qvar. How long does it take for Qvar to start working? Generally, you may see an improvement in your symptoms within 1 to 2 weeks of starting the medicine. However, it may take longer (between 3 and 4 weeks) to feel the full benefits. If you do not notice any improvement to your condition within the first week of using your inhaler, speak to your doctor. How do I store Qvar? Do not store the medicine in an environment which exceeds 25° Celsius. Avoid storing Qvar in direct sunlight. Protect the medicine from frost. Do not puncture or burn the canister, even if it seems to be empty. Does Qvar cause oral thrush? Corticosteroids, such as those found in Qvar, have been reported to increase the risk of oral thrush. Oral thrush is a fungal infection in the mouth which causes white patches on the tongue, roof of the mouth, and the inside of the cheeks. To prevent oral thrush, rinse your mouth with mouthwash or brush your teeth after taking Qvar. Do not swallow the rinse. Speak to your doctor if you develop oral thrush for appropriate treatment. Can Qvar be taken with albuterol? Yes. It is common to be prescribed with both a preventer inhaler and reliever inhaler. Is Qvar the same as Clenil? While Qvar and Clenil both contain the same active ingredient, beclometasone dipropionate, they are not interchangeable due to differences in dosages. Only take medicine prescribed to you and don't mix brands of medicine, even if they appear to be the same. Before changing the medicine prescribed to you, speak to your doctor. Can I drink alcohol while taking Qvar? Yes - alcohol does not interact with Qvar. However, alcohol consumption should be reduced or avoided if it triggers your asthma. Is it safe to drive after taking Qvar? Qvar should not affect your driving ability. However, if you experience any side effects which may impair your driving, such as feeling dizzy or faint, you should avoid driving, cycling or operating machinery. How to buy Qvar inhalers online?